Clark’s Botanicals Retinol Recue Overnight Cream is a good retinol cream that helps keep your skin nice and moisturized. The texture and feeling of this retinol cream are super thick and luxurious, and it feels super soft and silky on the skin. This retinol is pretty easy to apply, but I really don’t like that this product comes in a jar. Especially for such an expensive product, I think the packaging should be more sanitary. One of my favorite things about this retinol cream is the scent; it smells so amazing like a sweet sugar cookie. After using Clark’s Botanicals Retinol Recue Overnight Cream for a short period of time, my skin was feeling and looking moisturized and smooth. After using this retinol cream for a longer period of time, my skin was hydrated and plumped up. I felt like my fine lines were smoothed out because my skin was so hydrated and plump, but my wrinkles that are a bit deeper weren’t really looking much different. Overall, Clark’s Botanicals Retinol Recue Overnight Cream was a good retinol cream for helping with fine lines and moisturized skin, but didn’t help too much with my deeper wrinkles. The texture and feeling of Clark’s Botanicals Retinol Recue Overnight Cream are super thick and luxurious; the cream feels silky smooth and soft on the skin but doesn’t leave any sort of gross residue. Clark’s Botanicals Retinol Recue Overnight Cream is pretty easy to use, but something I don’t love is that this product comes in a jar. I don’t like when products like this come in a jar because every time you dip your finger into the retinol it can contaminate the product, and for such an expensive product, I wish the packaging was better. Since Clark’s Botanicals Retinol Recue Overnight Cream is such a thick cream, this product takes a while to dry, and it never totally dries down. But, even though it doesn’t totally dry down, it’s not sticky or greasy. The smell of Clark’s Botanicals Retinol Recue Overnight Cream is the best part about this product, it smells amazing! The scent of the product is like a yummy sugar cookie. After using Clark’s Botanicals Retinol Recue Overnight Cream for a short period of time, my skin felt super moisturized and the texture of my skin was very soft. After using Clark’s Botanicals Retinol Recue Overnight Cream for a longer period of time, my skin was super hydrated and plumped up. The plump and moisturized skin helped with my fine lines, but I wouldn’t say it helped too much with the deeper lines on my neck and forehead. Clark’s Botanicals Retinol Recue Overnight Cream is full of a ton of interesting ingredients including jojoba oil, colloidal oatmeal, and algae. Jojoba oil is great for anti-aging because it’s supposed to help the skin diminish age spots, smooth out fine lines, and help with other signs of aging. It’s also considered a very hydrating oil. Colloidal oatmeal was a very interesting ingredient to see because I haven’t seen it in other retinol products I’ve tried before. It claims to be good for anti-aging because of its moisturizing and nourishing properties. Many people use it to soothe their skin as well as use it as a protective barrier. Algae is another super interesting ingredient that is used in many high end skincare lines. It’s an extremely hydrating ingredient that is meant to protect your skin from free radicals that can cause premature aging to the skin. These three ingredients are unique and interesting, and when working together, should help greatly with fine lines and wrinkles. 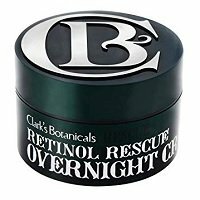 The cost of Clark’s Botanicals Retinol Recue Overnight Cream is $98.00 for 1.7 oz of product, which comes out to $57.64. This retinol cream is definitely super expensive, although the jar does come with a lot of product. Thankfully Clark’s Botanicals Retinol Recue Overnight Cream has a 30-day money back guarantee so you can try this product risk free. To buy Clark’s Botanicals Retinol Recue Overnight Cream, click here. Ingredients Algae fights off free radicals from the skin.